Dauphin is a City of Festivals. We have street fairs, world class music & cultural festivals and fantastic sporting events. There is truly something for everyone here. Take a look at our Keystone Events section to find out more about our signature events and how you can get involved. You can also see what great venues and amenities we have in our Facilities section. 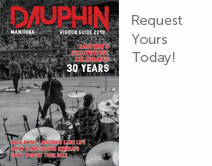 Dauphin is a City for Outdoor Pursuits. Satisfy your need for speed, fresh air, big fish, or peaceful exploration. You name it, we have what you need whether you’re an adrenalin junkie, weekend warrior, or just looking for some family fun. Take a look at our Outdoor Adventure & Geocaching section to find out what you can do in our backyard! Dauphin is a City of Culture and is proud of its many Provincial and National Heritage sites that appeal to young and old alike. The Fort Dauphin Museum is a Manitoba “Star Attraction” and will take you back in time once you walk through its palisade walls, and our Historic Ukrainian Catholic Church of the Resurrection is a “Prairie Cathedral” that will take your breath away. Take a look at our Museums & Heritage section to find out more about our rich history!